Home » Blog » Meet Our New Treatments! From a powerful chemical peel, to high-speed ultrasonic technology, learn more about what our new treatments and technology can do to help you achieve your most radiant looking skin. Let us walk you through our new treatments and technologies, in detail, so that you can feel confident heading into your next skincare treatment with us. Cell turnover slows dramatically as we age; as this happens, it affects the skin’s appearance and texture in a variety of ways. From fine lines and wrinkles to acne and hyperpigmentation, chemical peels are one of the most effective ways to address these changes. 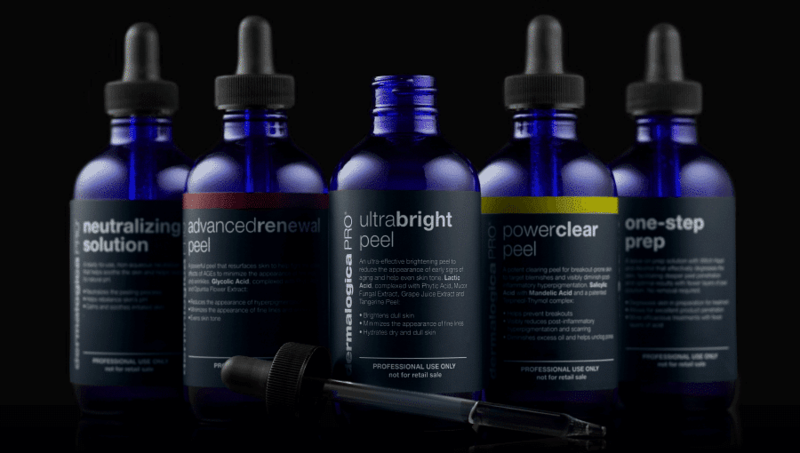 The Pro Power Peel is a professional-grade chemical peel that gives your skin therapist the flexibility to target your main skin concerns, including: pigmentation, fine lines, wrinkles or acne, by mixing or layering different types of peels, specific to your needs. This is a powerful treatment, that may not be suitable for all. Though you will be in a comfortable environment, this procedure is not described as a relaxing facial. During the treatment, you may experience slight stinging, itching and irritation, however our skin care therapist will guide you through each step, ensuring your comfort and sensitivity levels are at the heart of their procedures. At the end of the treatment additional modalities will be used to replienish and calm the skin along with a detailed explanation of guidelines and what to expect post-peel. In the days following the chemical peel, your skin may appear red and flushed, and may be more sensitive. Side effects include but are not limited to dryness, stinging, itching, irritation, redness, swelling, tightness, peeling and scabbing. By the second day and third day, an appearance of glow or depth to the skin tones may become noticeable, and peeling of skin may begin around the nose and mouth, followed by the cheeks, forehead, jawline and neck. -Have received botox, a skin resurfacing procedure, laser or light therapy or a chemical peel within the past two weeks. If you would like to know if this treatment is right for you, we recommend booking in a free skin consultation with one of our skin care therapists. They will be able to answer any questions that you may have, and will be able to guide you toward the most suitable treatments to help you achieve your skincare goals. A fully personalized experience with an innovative approach. Using a combination of advanced products, techniques and technology, your skin care therapist will customize the treatment for you at every step. Suitable for all skin types. Comprehensive, yet relaxing. Each treatment will begin with a Dermalogica double cleanse, followed by face mapping so that your skin therapist can see the areas of your skin that require attention. Next, a selection of advanced products, techniques and/or technology will be applied to best benefit your skin and address your main skin concerns. This may include the incorporation of equipment use (such as the BT Micro), however your skin therapist will tailor to your unique needs and treatments will differ every time. The treatment is completed by layering a series of products, that will have you leaving with a healthy glow! The ProSkin60 is ideal for clients are not in a rush and who want a comprehensive, customized approach to address skin concerns. Deep Clean – when used during the cleansing phase, the flat, peeling probe works to push out embedded dirt and oil, using high-speed ultrasonic and micro-current oscillations. Cleanser is better able to penetrate, leaving a deeper, purifying clean. Exfoliate: the peeling probe, combined with penetrating vibrations, effectively removes congestion, leaving skin primed for further product penetration. Your skin therapist will use this in conjunction with exfoliation techniques and products, to soften your pores to gently perform the extraction process. Moisturize: combining ultrasonic and micro-current at clinically tested parameters, moisturizers and creams are able to be absorbed by the skin in quantities of up to 75% more, when compared to topical applications. Serum Delivery: expedites the delivery of serums deep into the epidermis, delivering deep and corrective skin results.